So for the past 2 months an idea has been rolling around my head and rolling and rolling! And finally I felt confirmation from God to ahead with these plans. I’ve had many business plans in the past but they’ve always died down. This one, would not leave me alone!! I've shared my idea with some of you and you have been very supportive, thank you! 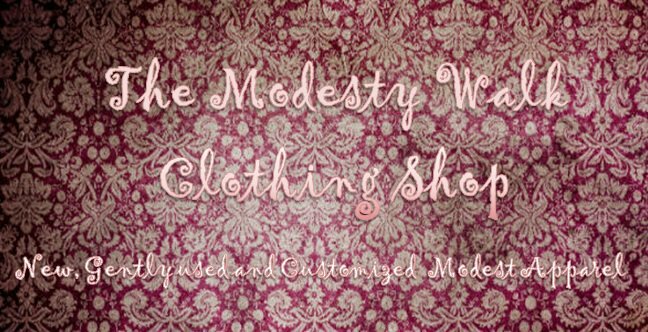 So I’d like to announce that The Modesty Walk Clothing Shop will be open for business at the end of July!! I will provide you with more details of what we will be selling in the coming days but for now I can tell you, we will have a little bit of everything! However, our focus will be on Bottoms (skirts!) as those are the hardest to find Modest. Our mission is to provide you with Modest, Unique and Distinctive clothing pieces at a reasonable price. Some will be new, some will be gently used and some will be custom made! Are you as excited as I am!?!? !